Wizard Property Services offers a wide array of landscape and outdoor maintenance services! Whether you’re a DIY’er that simply needs a little help with their project, or need to hire a contractor to handle the whole project from ground-breaking to cleanup, we can help. 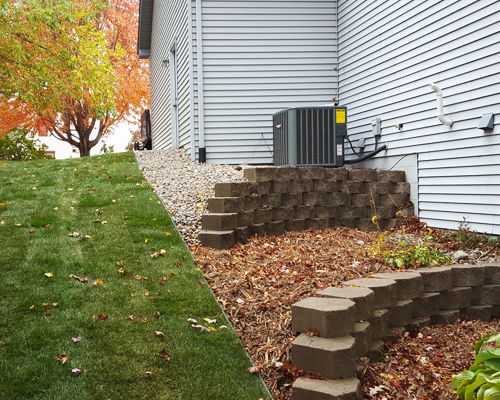 From a simple mulch job, renovating an entire lot, to drain tile and erosion control, we can handle it all! Whether you’re a homeowner, commercial property manager, or apartment community director, we can help with your weed control needs! Many homeowners call us for one-time applications as needed, while others contract us for the whole season. Large properties or small, we can spray them all! For homeowners wishing to do work in their own yard, we can deliver any landscape materials you need! Whether it be soil, mulch, wood chips, sod, etc., between our buying power and reasonable delivery rates, we can provide a much better value on bulk landscape materials than you will find at home improvement centers. Have a property to sell? A neglected rental property? Newly acquired property? Did you lose control of your back yard? Regardless of the reason, if your property needs help, give us a call! We love polishing those “diamond in the rough” properties and making them shine. We offer brush clearing and shoreline cleanup services for all types of properties: un-maintained rental or foreclosure properties, newly acquired properties, lawn expansion, etc. When it comes to cleaning up your overgrowth, make us your first and only call! Yes, we can trim your trees too! Whether you have a few low branches that need to be removed, or need our climber for more extensive work, we can help! All tree debris is hauled to recycling facilities where it can be turned into mulch or composted into soil. Have a landscape or property maintenance need not mentioned here? Give us a call! If we can’t help, chances are we can refer you to someone who can!